When you really think of it, Yamaha makes much more than just drums. They are a huge company that makes Motorcycles, home theaters, all terrain vehicles, and other sound equipment. Musical instruments seems to be a second in their business. The fact is, they are hugely recognized with the innovative designs and amazing quality drum sets. They have set the standards for many competitors. Yamaha has been around ever since 1887, where they stricktly made organs. This was called the Yamaha Organ Maufactoring Co. and it was located in Hamamatsu, Japan. 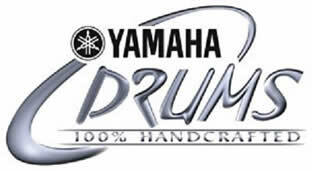 Although Yamaha has been around for over 100 years, they have only been making drum sets since 1964. At first, Yamaha ripped off designs from famous drums such as Ludwig, but eventually founds its place with the big leagues. Yamaha was on top for shell construction, and shell finishing. One of their biggest designs that is still used and mimicked to this day, is their YESS drum mounting designs. This stands for Yamaha Enhanced Sustain System. This type of hardware does a great job of mounting the drums with minimal contact to the drum itself – thus maximizing the resonance of the drum. Yamaha’s biggest drum lines were the Recording Custom 9000. These kits were one of the best for recording studios, and are still used to this day in most studios. Recently, Yamaha has re-released the Recording Custom along with the YESS hardware. Yamaha does not only make acoustic drum kits, they also make electric V-drum kits. They have been making these for many years now. Here is a complete list of Yamaha’s current drum kit line. Great sounding kit with 100% maple shells, and the Air Seal system. This kit sounds amazing, and woks great on the road for the gigging drummer. There are many different types of Yamaha Absolute drums you can pick. Each sound great with There are 2 types of Absolute kits, there is the Absolute, then the Absolute Nouveau. YESS hardware and Air Sealed. Here are the different kits you can get. A drumming standard for Maple shell drum kits. This professional sounding 7 -10 ply maple drum set is a Amazing sounding kit. Many colors and very customizable. YESS hardware and air sealed. An industry standard for recording studios. This 100% birch shell packs quite a warm clean sound with tons of resonance for the studio. More expensive, but very professional sounding. YESS hardware and Air Seal. Unique designs make these drum kits easy to carry with you. With a decent sound, these kits are great for smaller performances and jazz bands. Mid price range. Great entry level drum kit with YESS hardware and Air sealed toms. This drum kit sounds great for performances, but is still affordable for those with a budget. Great entry level drum kit for beginners. 6-ply Mahogany Shells offer a loud punch for a great price. Excellent for beginners with a budget. Yamaha Flying Dragons - This is Yamaha's line of bass drum pedals.